Nice pub. Brews its own beers, but on my visit they were not very good. I've had one of the same beers at a beer festival, and it was OK. Perhaps it was dirty pipes, or just an off-day in the brewery. But there was a distinct feel of poor quality home brew about the beers. First visit here when I've been sober enough to remember it! 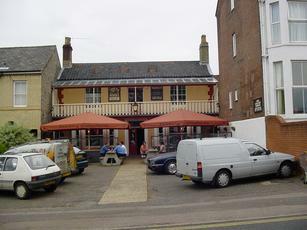 This is another pub that is close to Norwich's football ground and it is also very convenient for the station. As the brewery tap for the Chalk Hill Brewery, they had the Best, Gold, Dreadnought, Flintknappers & Old Tackle. Live football was being shown on the TVs. A noisy place that presumably is popular for food on non-matchdays. My first Norwich pub since the Fat Cat in 2003. Fairly busy on Tuesday night but the Norwich v Forest youth cup tie had something to do with that. 6 brewery beers on handpump - advertised on a chalkboard, but there were so many chalkboards (foody stuff) I missed it - came back 2 more times so had all their beers. The brewery tap beer was £2.40, also tried CHB and Gold - better on a warm Summers day as they were not strong tasting. In total contrast was the Flintknappers, Dreadnought and Old Tackle which were more chewy. They close at midnight (Friday night?) which saved my bacon when I though my drinking was all over. Good pub. Large establishment and not cheap, but good range of ales, friendly helpful staff, decent pub food, easy walk to the football ground and station. Does get very busy on match days. Sky sports and a roaring open fire. This is a very, very popular pub which gets exceedingly noisy. Packed with red faced, middle aged 'shouties' who cannot/will not hold a sensible conversation without shouting at each other. Definitely not the place to go for a quiet drink. The beer however is pretty damned good although the session beer is too weak and wishywashy for my taste. I really enjoyed the Dreadnought and the strongest one were excellent. Friendly staff and decent reasonably priced food too. But for a quiet pint, I had to sit outside with the nicotine addicts.